The European Tour has already staged two events in the United Arab Emirates this year - the HSBC Abu Dhabi Championship and Omega Dubai Desert Classic - and will be back there in November for the season-ending DP World Tour Championship. The Ladies European Tour, which already had the established Omega Dubai Ladies Masters on its schedule, has just added a second UAE stop - the Fatima Bint Mubarak Ladies Open (FBMLO) taking place at Saadiyat Beach in Abu Dhabi this November. The European Senior Tour will also have a desert destination in 2017 following the recent announcement that the Sharjah Senior Masters is being hosted next March at the Sharjah Golf and Shooting Club. It’s the European Challenge Tour, though, that is perhaps set for the most exciting upcoming step of all in the Middle East when it once again breaks new ground on the global golfing map with a maiden voyage to Ras Al Khaimah. For those not geared up on their geography, it is the northernmost of the seven United Arab Emirates and forms part of a triangular-shaped headland which adjoins Oman’s northern exclave of Musandam. The Ras Al Khaimah Golf Challenge, to be held at Al Hamra Golf Club on 26-29 October, will be the biggest sporting event in the history of the emirate, which is located just 45 minutes from Dubai International Airport. Carrying a prize fund of $350,000, the event is being sponsored by the Ras Al Khaimah Tourism Development Authority. The penultimate tournament on the Challenge Tour schedule, it promises to throw drama aplenty as players get one final chance to be in the 45-strong field for the following week’s NBO Golf Classic Grand Final in Oman. 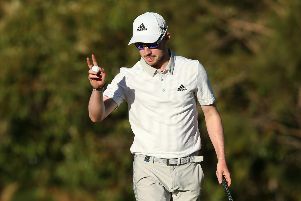 The top 15 players in the rankings after that event will graduate to the European Tour, following in the spikemarks of players like Thomas Bjørn, Martin Kaymer, Henrik Stenson and Justin Rose. “We are really delighted and excited about signing this deal with the European Challenge Tour,” said Haitham Mattar, CEO of Ras Al Khaimah Tourism Development Authority. “We had been looking the for right golf partnership, and this seems to be the one. Designed by Peter Harradine, the Al Hamra course measures 7,325 yards and meanders around four interconnected Arabian Gulf water lagoons. “We have two really under-rated courses - Al Hamra and Tower Links,” added Mattar. “Al Hamra, the one being used for the Challenge Tour event, is in the middle of a community and on the sea as well. It is surrounded by hotels and beach resorts with great architectural designs. While the MENA (Middle East and North Africa) Tour goes from strength to strength, the Challenge Tour, with its main roots in Europe, is the more attractive proposition to Ras Al Khaimah from a tourism perspective. “We want to grow UK and European markets, so we feel this circuit is the best fit,” revealed Mattar. “Dubai, the biggest and busiest airport in the world, is only 45 minutes away and eight times out of 10 you will not hit traffic going either way. Alain de Soultrait, the Challenge Tour’s Director, has watched the circuit grow over the years and is “delighted” it is adding another new stop on the schedule this year. “Ras Al Khaimah is a destination fast growing in reputation and prestige and therefore fits perfectly with the mission of the Challenge Tour, which is to nurture the future golfing heroes of tomorrow, while also spreading the game to promising new destinations,” he said.